In Zambia, old mates and new are inextricably linked by friendship. Two contemporary men and two from the past; companions completely connected to one another over the years. Arnold and Elijah are African men and my companions as I explore this part of Zambia. They feel like new friends. They are working, of course, and I am their guest, but sometimes when humans meet it is, well, just two humans meeting. It feels like that with Arnold and Elijah. “The guest should not be a stranger,” says Arnold Mulimba, who is the general manager at the Sanctuary Sussi and Chuma tree house lodge near Victoria Falls, at which Abercrombie and Kent guests stay, and where Elijah Yevuka is chief guide. Our conversations are personal — about our lives, families, thoughts, beliefs. They ask about other places, and I ask about here. For it is completely noticeable that this bespoke luxury lodge, with its 12 tree houses on stilts and two family rooms just outside the town of Livingstone, with its restaurant overlooking the upper Zambezi River, its sunset deck, infinity pool and spa, is locally run. 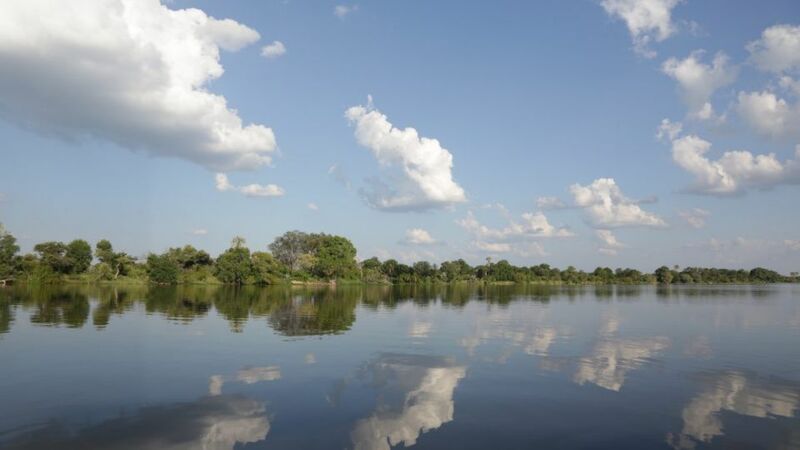 Elijah lives in Livingstone with his wife and two young girls, though he was born in a village where the Zambezi River rises, in the north of the country. His father was a wildlife police officer in West Luanga National Park. Elijah grew up with nature, wildlife and the river, and became involved in conservation work while at school. He joined the African Wildlife Foundation, did elephant conservation work and then trained as a guide and wears an almost permanent, beaming smile. Arnold was born in Namibia’s Copperbelt, but his father moved to Livingstone in 1987 to repair radios, and the family followed in 1990. He is still repairing radios from home. He went through primary and secondary school, but from the age of 13 had been helping Mr Phinias Hajaya, a neighbour who was a mechanic, and Arnold went to technical school to become a mechanic. He became involved in lodges through the operations side of things, maintaining vehicles and equipment. He’s been working at Sanctuary Sussi and Chuma since 2013, first behind the scenes, and now as general manager, having been studying management at night school. His predecessors have been from other countries, but then the Zambian government threw the emphasis on local employment. Sanctuary Sussi and Chuma lodge is right on the banks of the Upper Zambezi, upstream from Victoria Falls. It is also inside Mosi-oa-Tunya National Park, named for the “smoke that thunders”, and where Elijah will show me elephants and white rhino, giraffe and waterbuck. Just as Elijah gives Zambian flavour to this, there are Zambian flavours coming from the kitchen, too — another result, says Arnold, of employing local people. In the nearby Nakatindi village, I see some Abercrombie and Kent Philanthropy projects — the direct results not only of the lodge and its staff’s commitment to the local community, but that of visitors, too, through a contribution from their bookings and their personal donations. First there was a borehole for water, to stop people having to fetch it from the Zambezi, and the crocodile and elephant attacks that came with this. Next to this is an irrigated vegetable garden, and a mill to grind corn. A kitchen has been built and there is a feeding program. As soon as a meal was included in the school day, attendance immediately tripled, as many local families struggle to feed families. The school has been extended so that the last two years of education can be completed here. A clinic has been built, with nurses paid by the health department, and many outreach programs developed to reach into the community. Zambia has a one-in-seven HIV/AIDS rate; Livingstone, one-in-four — but programs are working, and the rate is reducing. There was a need for sustainable business, and then came the Chipego Bike Shop. Five women have been trained to repair and service bicycles, and one container of used bikes has come from the UK, one from the US. They work on the bikes, sell them, and made $US20,000 ($26,835) profit in the six months after starting in September 2015 — that will fund the next consignment of 400 to 500 bikes. There is a literacy program and there is to be more emphasis on education in sustainable and organic gardening and agriculture. Abercrombie and Kent Philanthropy co-ordinator Camilla Rhodes would eventually like to see a vegetable shop, with them selling produce to lodges, and the range that is being grown is being extended. Sussi and Chuma were African men and David Livingstone’s companions during his explorations of southern Africa. When he died, they mummified the Scottish missionary and explorer’s body, wrapped it in calico, bark and sailcloth and then tarred it to make it a watertight package — efforts pieced together by researcher and author Claire Pettit. And then Abdullah Sussi and James Chuma took Livingstone’s body from the village in Zambia where he had died, 1600km across Africa to the coast, to British authorities. The mummified remains of Livingstone were taken back to England and interred in Westminster Abbey nearly a year later. At the expense of one of Livingstone’s friends, appreciating their loyalty and courage, Sussi and Chuma followed and spent time touring in England but soon returned to Africa. Sussi had originally been recruited by Livingstone to cut wood for one of his journeys and Chuma was a boy when Livingstone released him from slavers in 1861. And there is the key to David Livingstone’s legacy in Africa. He travelled the southern part of the continent “missioning” and exploring, is thought to be the first European to see the Victoria Falls, followed the Zambezi River and became one of the first Europeans to cross southern Africa. He became obsessed with the search for the source of the Nile, pursuing this from 1866 until his death in 1873. He opposed slavery and was largely responsible for its abolition, a few weeks after his death. He had suffered some 30 bouts of malaria, but died from a mix of intestinal parasites and infections. Top picture: Chief guide Elijah Yevuka on the Zambia side of Victoria Falls by Stephen Scourfield. Zambia can be visited year round. The best time for game viewing is during the dry season, June to October, when animals congregate around the rivers and waterholes. Between November and March, during the wet season, the scenery is greener with newborn animals in abundance and lower prices. Roads in the Mfuwe area of the South Luangwa National Park are all-weather, so the park can be accessed year round, although some of the bush camps close during the wet season. The best time for water flowing over Victoria Falls is from March to May, so plan now. Luxury travel company Abercrombie and Kent specialises in private and small-group travel to southern Africa, including staying at Sanctuary Sussi & Chuma. 1300 590 317 or Abercrombie and Kent.